We are leaving for Disneyland again in the morning and Zoe is sporting a new hair-do for the occasion. 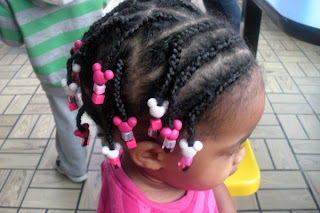 A few months ago, when Zoe first became obsessed with Mickey Mouse Clubhouse, I started looking for Mickey Mouse beads to put in her hair. I found a lot of beads, but none that had a big enough hole to fit over her braids. So, I decided to make my own. I made them out of Fimo clay. They were really easy to make and turned out so cute. Zoe wore them in October when we went to Disneyland and has asked for them every time we have done her hair since then. Wednesday, she finally got to put in her Mickey beads again and she was so excited. She wasn't as excited to sit still and get her hair done though. It is such a battle to get it done, but she is much more patient when it is getting braided than she is when it is getting combed out. The braids should last at least 2 weeks (hopefully 3) so it is worth it to get a couple week break from combing it. As much as she hates sitting still to get it done, she absolutely loves it once we finish it. She loves clicking her beads and showing it off to everyone she meets. Plus, as time goes on, I am getting quicker and she is getting a little more patient, so it is a little easier every time. I thought we would have to divide it up into 2 days this time, but we managed to have it completely done by lunchtime on Wednesday. Not too shabby. 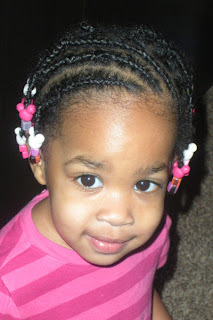 We did cornrows in the front and then box braids in the back. They are definitely the best cornrows I have done so far. I am getting better. By the time she is old enough to care how they look, I am going to be an expert. While I was out running errands today, I actually had two different people ask me where I take her to get her hair done. I love it when people ask that question. It makes me feel good to know that I am doing something right. I love her braids! She is such a cute little person! I have to say that I'm glad that I don't have a daughter just for that reason. I am not patient enough to do girls hair, especially something as complex as Zoe's. Luckily, Zoe's can stay that way for a while before she needs to have it done again, but you are a real pro! Awesome cornrows! I am so impressed! Hailey and I will be over for you to do hers (ha ha). Have fun at Disneylaand, we just got back and it was very fun (I love going when it isn't busy).